Chinese President Xi Jinping said here that China is ready to deepen friendly and mutually beneficial cooperation in various fields with Uganda in an all-round way. Xi made the remarks when meeting with his Ugandan counterpart, Yoweri Museveni, on the sidelines of the 10th BRICS Summit held in Johannesburg on July 25-27. 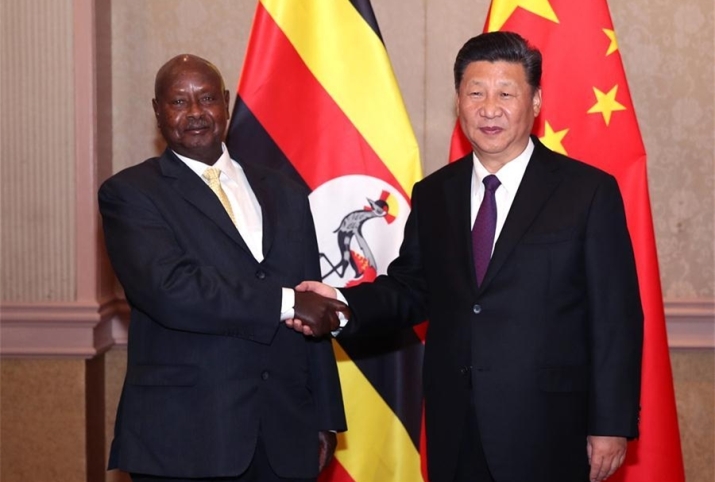 The Chinese president applauded Museveni for his long-term dedication to the promotion of the development of China-Uganda relations as well as China-Africa relations. Xi stressed that China and Uganda have seen sustained and rapid development of bilateral relations in recent years. Development strategies of the two countries are compatible and present each other with important opportunities, Xi said. He called on the two countries to maintain the momentum of high-level exchanges and continue to staunchly support each other on issues of their core interests and major concern. The Chinese side supports the efforts of the Ugandan side in developing economy and improving people's livelihood, and is ready to steadily advance major cooperative projects jointly with Uganda to better benefit the two peoples, Xi said. Xi called on China and Uganda to keep close communication on major international and regional hotspot issues and safeguard the common interests of the two countries and developing countries as a whole. Xi said that the Ugandan president has made important contributions to the development of the Forum on China-Africa Cooperation (FOCAC), and that China is willing to work with Africa to make the upcoming FOCAC Beijing Summit a success. Museveni said Uganda-China relations have seen strong development momentum. He thanked China for its long-term assistance to his country and said he is satisfied with the progress made in bilateral cooperation. Uganda hopes to deepen practical cooperation with China in such areas as industrial parks, infrastructure construction and electric power, and welcomes more Chinese companies to invest and develop in Uganda, he said. Museveni said the Ugandan side supports the Chinese side in hosting a successful FOCAC Summit in Beijing.